Michelle McKay gives Cecelia Ponzini a hug at the CARAS Awards Breakfast March 30, 2019. 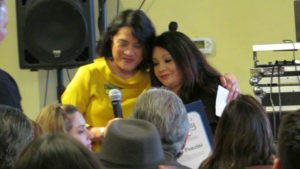 Many members of the South Valley community were honored by CARAS (Community Agency for Resources, Advocacy, and Services) at Gilroy’s Old City Hall Restaurant, March 30 as part of the annual Cesar Chavez Celebration and Community Champions Program. 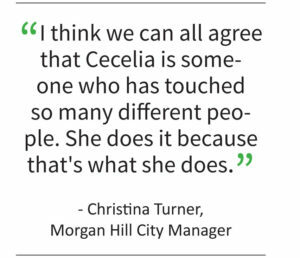 Christina Turner is the city manager for Morgan Hill. She praised Ponzini’s work with the many volunteers who help families and people in need through the Cecelia’s Closet and other programs the Prado Foundation runs. Michele McKay, a board member on the Prado Foundation, told those attending the event that Ponzini is lovingly called “the queen bee” for her leadership.